1) Mix crumbs with melted butter; press into a well-greased 9inch square pan (or round if you're opting for the pie version). Bake at 350 degrees F for 10-15 minutes. 2) Cream together butter, icing sugar and eggs. Beat until very light, then spread over the crumbs. Note: Ensure your butter has reached room temperature, otherwise you will be left with butter bubbles in your mixture which are just plain nasty to bite into. 3) In the meantime, drain the pineapple and fold into the cream; otherwise, prepare the Dream Whip according to package instructions and drain/fold in your pineapple. This alone is AMAZING! Pineapple and whip go so good together! 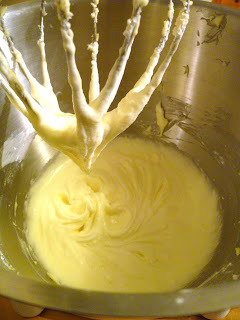 4) Finally, spread the whipped layer over the butter mixture and top with additional crumbs. Place in the fridge for 2-3 hours before serving/cutting. When you're ready to cut them, you should be able to pop the entire dessert out onto a serving platter by lifting the crust with utensils (this will avoid scratching whatever pan you made it in). So, I have a question, Can I used A can or Carnation thick cream in plaved or dream whip. My mom used to make a similar recipe but she used a can of thick cream.. I don't like raw eggs in anything I make, I think I would opt to leave eggs out of this recipe. It sounds and looks good except for raw eggs!